There’s a very good reason that Battle Creek, Mich. hosts the world’s longest breakfast table event every year—it’s the birthplace of both Kellogg’s and Post cereal companies. How they both came to be founded in the same city, and where TDS has many customers, is an interesting story. In 1876, a year after graduating from medical school, Dr. John Harvey Kellogg became the superintendent of what would become the famous Battle Creek Sanitarium. It was a health resort that encouraged diet reform including a low-fat, low-protein diet with an emphasis on whole grains and fiber-rich foods. One of Kellogg’s food inventions, the corn flake, was sold by his brother, Will Keith Kellogg when he founded the Battle Creek Toasted Corn Flake Company—or what is now known as Kellogg’s. Meanwhile, C.W. Post had a series of nervous breakdowns due to the stress and overwork on the job. 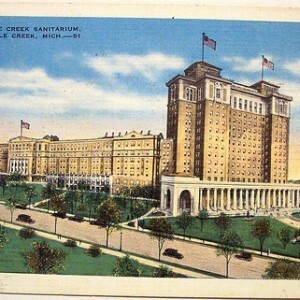 After traveling throughout Europe in search of a cure for his ailments, Post visited the Battle Creek Sanitarium. Based on what he learned, he was inspired to create his own company based on the healthy foods he was served. His first product was Postum, a cereal beverage. His second product, and first cereal, was Grape Nuts. If Civil War history is more your thing, you’ll want to stop by the Underground Railroad Sculpture. Battle Creek was an important station on this railroad, helping escaping slaves reach freedom in Canada. In fact, Sojourner Truth, abolitionist and woman’s rights advocate, visited Battle Creek in 1856 and moved to the city a year later. In her honor, a 12-foot tall bronze statue was erected in 1997, the bicentennial of Truth’s birth.